If you are looking for a fast, lightweight, and powerful crossbow that also comes with a compact design, Barnett may have exactly what you need. The Ghost 410 comes with all of the great advances as the popular 400 model, only in a smaller frame. Designed by the skilled engineers at Barnett, the Ghost 410 will give you the speed and power you need to make accurate kill shots in a small, easy to handle package. The build of a crossbow is one of the most important factors to consider, and this is evident in the Ghost 410. It features a lightweight construction that won’t cause arm fatigue, and since it only measures 20 inches from axle to axle it is comfortable for children and adults to use. The crossbow also weighs 7.3 pounds so you can easily carry it to your destination. Constructed from a lightweight carbon material the riser is built to provide stability and balance. Like most of Barnett’s crossbows the Ghost 410 has shifted much of the weight to the shoulder. This ensures that the crossbow features a well balanced build that won’t throw your aim off when you are drawing. The riser also includes several safety features, making this a well constructed crossbow that is ideal for archers at all skill levels. Another aspect to consider is the design of the crossbow. Not only will this determine its appearance, but also how well it performs. Barnett has ensured that the Ghost 410 comes with a sleek and stylish design that you will enjoy shooting. The all black crossbow simply looks impressive, and it also performs as well as it looks. The Ghost 410 is also designed with safety in mind, which is another reason why it is an excellent choice for beginners. The safety switch automatically engages, and won’t release until an arrow is properly secured. While this makes it almost impossible to misfire the crossbow, you have the added protection of the anti- dry firing device. Not only does this help to prevent arrows from being released before you are ready, it can also prevent dry firing that can ruin the bow’s accuracy and performance. The grip is designed to be comfortable to grasp, and you will appreciate the finger slots which help keep your hands below the release path of the sting and arrow. 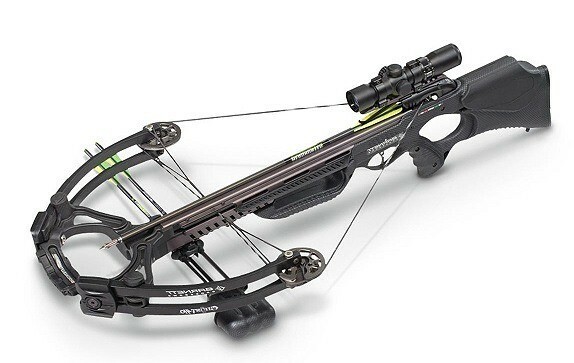 Every aspect of this crossbow is designed to provide you with an exceptionally smooth and powerful performance. The crossbow is capable of maximum speeds up to 410 feet per second, which ensures that you can easily keep up with a moving target. Backed by a 185 pound draw weight, you can easily penetrate almost any type of target. The crossbow is also capable of generating up to 150 pounds of energy, which makes the Ghost 410 an extremely powerful crossbow. To ensure a smooth performance with every draw and release, you have the advantage of the include rope cocking mechanism which will easily handle the bow’s heavier draw rate. This also makes it easier to hold a draw when you are waiting for the perfect shot, and eliminate any jerky motions that might interfere with your accuracy. Everything you need to start hunting is included with the Barnett Ghost 410 crossbow. It comes with an informative instruction manual that will easily guide you through the simple set up steps. The crossbow also includes all of the necessary tools, so you can assemble it quickly and start practicing your aim. As an added bonus the crossbow comes with Barnett’s exceptional 5 year limited warranty. An accurate 3 x 32 mm scope is included with the crossbow kit, and it is accurate up to 20 yards with the factory settings. The scope can also be easily adjusted for accurate groupings, and to make shots from a distance. The attachable rope cocking mechanism ensures that each draw is smooth and effortless, and the talon style sling makes the crossbow easy and convenient to carry when you are hiking to your next location. It also comes with three arrows and a convenient quiver, so there is no need to wait to use this powerful crossbow. Barnett consistently designs and manufactures high quality and top performing crossbows, and the Ghost 410 is no exception. It comes with the sturdy, lightweight and well balanced build that Barnett crossbows are famous for, and is capable of providing you with plenty of speed and power to humanely take down almost any North American game animal. Capable of maximum speeds up to 410 feet per second and capable of generating up to 150 pounds of kinetic energy, this compact bow is perfect for any type of hunting trips. Its compact 20 inch design also makes this bow easy to maneuver in cramped hunting blinds. Capable of maximum speeds up to 410 feet per second and able to generate 150 pounds of kinetic energy you can easily penetrate almost any target. You will appreciate the bow’s lightweight and compact design that makes it an ideal choice for hunters of any size and skill level. Everything you need to start hunting small and large game is included, along with a convenient rope cocking device. It should be noted that this powerful crossbow does not include a dampening system which might make it too loud to use on all hunting trips.